The ‘Up The Yard Race Day’ will take place on the first day of the 2017 Punchestown Winter Festival, tomorrow, Saturday 18th November, at Punchestown Racecourse. This event is in recognition of the stable and stud staff of Ireland who work the best horses every day and contribute to the success of the Irish racing industry. 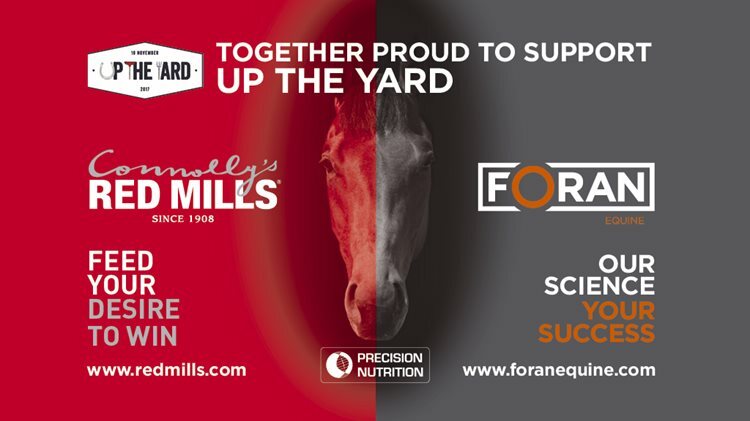 Connolly’s RED MILLS and Foran Equine are delighted to be part of this event. Together with Tattersalls Ireland, we are sponsoring the hospitality in the Sports Lounge, including a plentiful supply of party food style platters of Chicken Goujons, Cocktail Sausages, Wedges and more. Also, the groom in charge of each of the 8 of the race winners will receive a RED MILLS or Foran Equine jacket. There will be a full programme of inter-yard games and challenges with a selection of spot prizes and vouchers to be won. The first game will be ‘Load Up Lads’, at 12:10pm in the Parade Ring, sponsored by RED MILLS and Foran Equine. We are looking forward to seeing you all at Punchestown Racecourse tomorrow !